UPDATE: THIS CHALLENGE ENDED ON THE 5TH APRIL, 2019. PLEASE VISIT CODEMOTION.COM FOR OUR ONGOING CODING CHALLENGES TO WIN TICKETS FOR FOR CODEMOTION MADRID 2019, MILAN 2019, AND BERLIN 2019! What comes first? What is the most powerful? Can you win all-the-time? Compete then! Participate in the Github-Codemotion Amsterdam Rock Paper Scissors Competition, and win one of 20 FREE tickets to Codemotion Amsterdam. In a Rock Paper Scissor tournament, the contestants stand in a straight line. Each pair of consecutive players compete in a round. If there is an odd number of players, the last one in the line qualifies for the next round without playing. 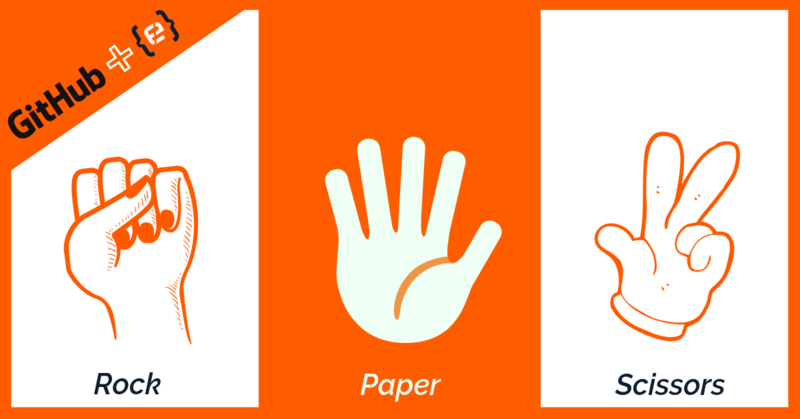 For each game, each player indicates either a rock, paper or scissors denoted ‘R’, ‘P’ or ‘S’ respectively. You are free to choose any language from a list of over 18 coding languages! Sign up, create an account and compete for glory! CHALLENGE ENDS ON FRIDAY, THE 5TH APRIL AT 23:00 (GMT+2)! One person can win only one ticket. Plagiarism is flagged and banned from the competition. Fake accounts are banned from the competition. The tickets cannot be exchanged to cash or anything other than actual Codemotion Amsterdam 2019 2-day entrance tickets. The full price of the tickets is currently EUR 580. The competition ends on 28 March 2019.